Sift the flour into a glass bowl and add the cubed butter. Stir together until it resembles breadcrumbs. Add the Parmesan cheese and stir through. Create a well in the centre of the mixture, add the egg and work until the dough comes together. Turn out onto a lightly-floured surface and cover with clingfilm. Divide the pastry into 10-12 equal pieces and roll each piece of pastry to a 5mm depth. Grease 10-12 tartlet cases and press each pastry disc into place. Place on a baking tray and put in the fridge for half an hour to rest. Bake in the oven for 15-18 minutes until cooked. Heat half the olive oil in a pan and add the leek. Cook over a medium heat for 8-10 minutes until softened. Add the garlic and cream and cook for a further 4-5 minutes until reduced. In a separate pan drizzle the remaining olive oil. Cook the prawns for 2-3 minutes on each side until cooked. 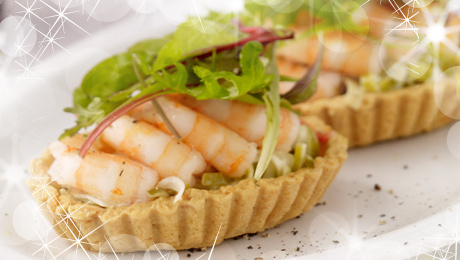 Divide the leek mixture between each pastry case and top with 3-4 prawns. Dress with a little tomato and baby green leaves. I plan to use this as a Starter for Christmas Dinner.